This book is a translation of a Chinese language book, written by Chen Xin at the turn of the 19th to the 20th centuries, completed in 25 years and finally completed in 1908. 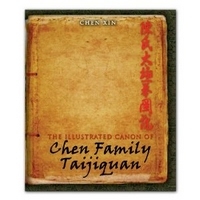 It is often quoted as the definitive written source for Chen style taijiquan. It is a weighty volume with theory and practice espoused equally and in great depth. It is full of diagrams and esoteric references. Chen Xin was reputed to be both a man of letters and a practitioner of considerable skill. With such promise I eagerly awaited its translation, which was I suspect a daunting and length process. It was sent to me by the publisher to provide a review and it was with great regret that I was unable to provide a more positive one. The volume was translated by an Australian Yang Stylist whose understanding of taijiquan I think interfered significantly (or at least I hope that is what happened.). The result is a technical nightmare, with flashes of brilliance interspersed with much that is incomprehensible to me. In part this is because there are numerous errors in the text – I assume as a consequence of translation. Some of these are obvious - I particularly like the “empty left leg and step with right leg.” Most are not. The language of taijiquan, like all Chinese, is context driven. Many of the characters have meaning specific to taijiquan. So looking them up in a dictionary, or asking a non-chen style taijiquan practitioner to provide the meaning of a character is a recipe for disaster. That is almost what this book is. Without a high level practitioner to decipher the meaning and a good translator whose understanding of taijiquan is sufficient, (I would suggest at least Level 2 – given there are no non-Chinese Level 3 practitioners,) this result was largely predictable. Instead of a treasure, the publishers have produced a book of dubious merit. Having read all 670 pages twice, I can see why most people would feel suitably daunted. Despite the meticulous copying of all the drawings and translation of texts, this book offers insights that are hard won. I could not recommend it to a beginner or even an intermediate level practitioner. As such its value is limited.